Michael Schaffer started running in 2007 when he quit smoking. 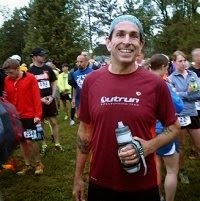 He ran his first 5k race in June of 2008 and has since run many races of marathon distance or greater. He was able to complete three 100 mile trail races in 2013. "I use my running to keep me physically and mentally in shape," says Schaffer. Schaffer also acts as the VP of Northeast Running Club (NERC) and is an Ambassador for Runwell, a nonprofit organization which raises funds to help people in their fight against substance abuse. Even though he mostly run trails and has a 100 miler on his 2014 schedule, he has also decided to hit the roads too in pursuit of a Boston Marathon qualification at the 2014 Columbus Marathon in the fall. 'Give back to move forward.'"